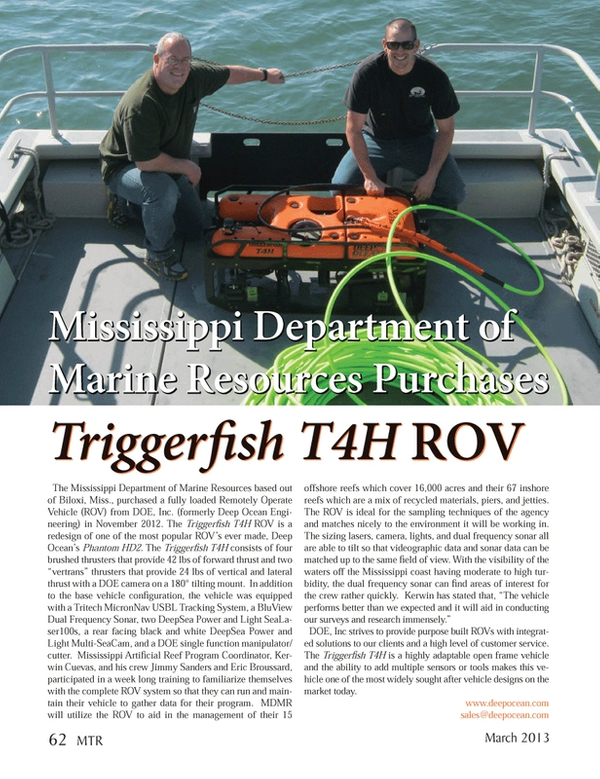 The Mississippi Department of Marine Resources based out of Biloxi, Miss., purchased a fully loaded Remotely Operate Vehicle (ROV) from DOE, Inc. (formerly Deep Ocean Engineering) in November 2012. DOE, Inc strives to provide purpose built ROVs with integrated solutions to our clients and a high level of customer service. The Triggerfish T4H is a highly adaptable open frame vehicle and the ability to add multiple sensors or tools makes this vehicle one of the most widely sought after vehicle designs on the market today.